If you’ve set all the basic security settings mentioned in my previous Securing Wireless Network Using Maxis WiFi Modem (E5832) post and want more, here is the advanced part. By setting SSID Broadcast to “Disabled”, the network name will not be shown in the connection list. People who doesn’t know the network name won’t be able to see it in the connection list and therefore preventing strangers from connecting to our network. Anyway, we’ll need to manually add the network into the connection list when we connect to the network for the first time. One of many reasons I like using this Maxis WiFi Modem (E5832) together with the Apple ipad is that it supports many security features. Security is of the utmost importance especially in wireless network because we can never be sure who is connecting to the network if we don’t secure it. 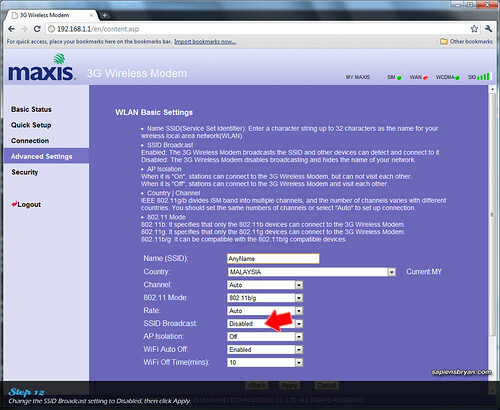 I’ve compiled a step-by-step guide to effectively secure the wireless network when using Maxis WiFi Modem (E5832). We’ll need to connect the modem to a PC for configurations. Step 1: Connect the modem to a PC, then switch it on. 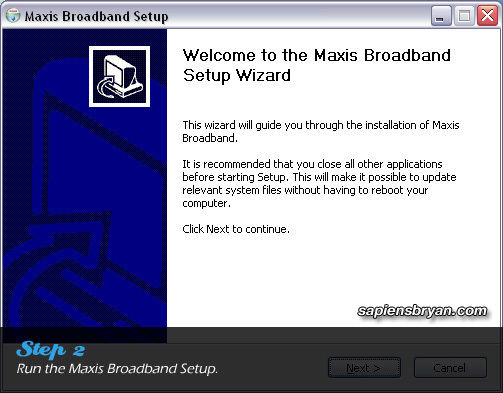 Step 2: Run the Maxis Broadband Setup to install device driver and necessary applications. Another new feature added into Ovi Maps 3.06 is “Add a public place“. You are able to add new places that Ovi Maps doesn’t have it yet, once it is reviewed everyone else will be able to find it in the maps. 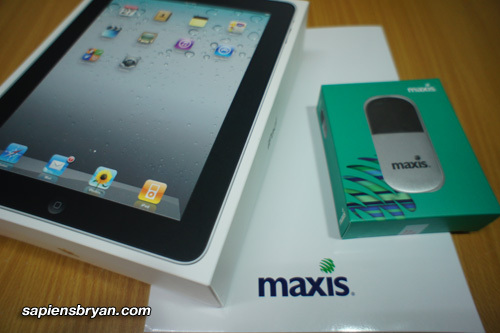 Maxis Wireless Broadband Special Promotion! Save RM20/month! A staff from Maxis Telemarketing Team called me yesterday to offer a special promotion for its Wireless Broadband service, so I thought I should share it with you all as well. In this special promotion, the price for 3GB wireless broadband package is reduced to RM48/month only (from the original price of RM68/month)! 1. A Maxis postpaid customer. 2. Has been using the postpaid line for more than 12 months. 3. Never subscribe to any Maxis Broadband before. Enjoy up to 7.2Mbps wireless broadband speed. Save RM20/month from the original price. RM10 rebate for the first 5 months. 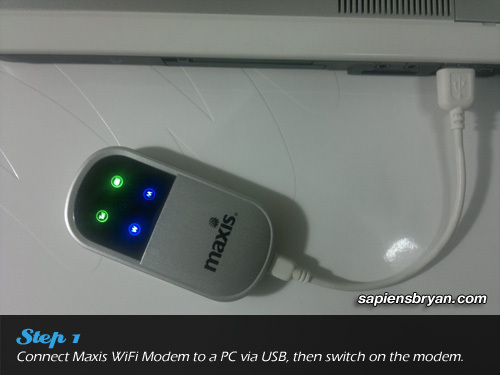 The free modem supports only 1 device, so if you are interested in sharing the wireless broadband connection with other devices you may want to consider getting Maxis WiFi Modem E5832. 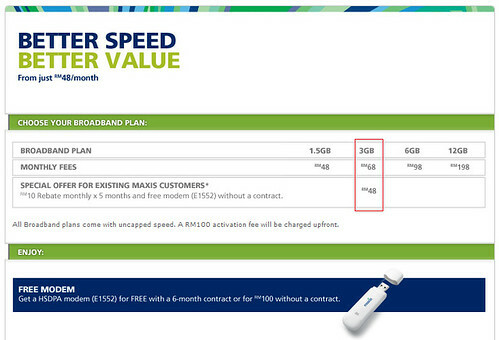 Please feel free to visit Maxis Wireless Broadband page or call this toll free number 1800 82 2000 for more information. 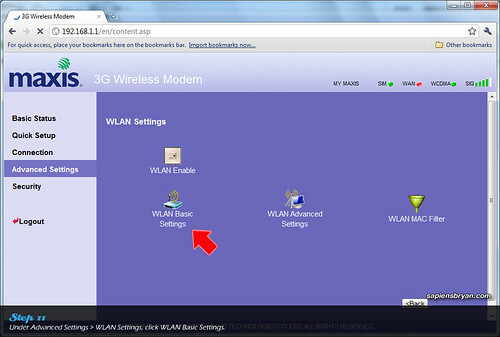 If you are a wireless broadband user, you might come across the following situation when you want to share the broadband connection to more than 1 device. Most of the wireless broadband modems in the market allow you to make connection from only one device at one time. So if you want to access the same wireless broadband service on 2 or more devices, you’ll need unplug the modem from one device then plug it to another. This is quite inconvenient especially when you need to switch between the devices regularly.